For the whole of the 1980s, singer Belinda Carlisle was the symbol of success, first as the lead singer for the groundbreaking band The Go-Go’s, then as a hitmaking solo artist. Lately we hadn’t heard as much from Belinda as we used to. This has recently changed for a couple reasons. 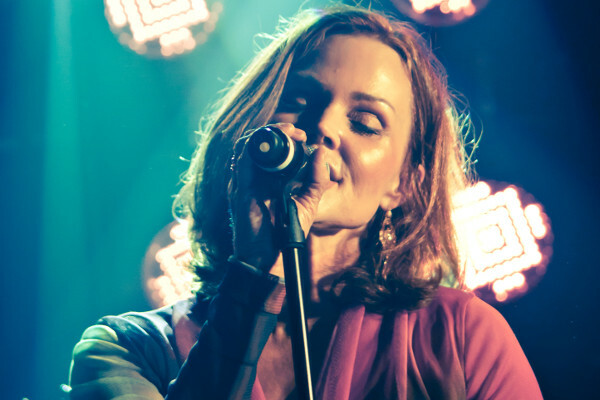 Universal Music is releasing a Belinda Carlisle solo retrospective as part of their Icon series, and Carlisle put out an unflinching memoir titled Lips Unsealed in 2010. The latter openly chronicled all areas of her life, including harrowing details of her difficult childhood, her rise from Dottie Danger and role as one-time drummer for the punk band Germs, her eventual ascension to pop’s heights and concurrent depths behind the scenes. Popdose had the opportunity to catch up with Carlisle to talk about the Icon disc, her solo years, and to speculate on what life would be like for the Go-Go’s had they started in the Aughts instead of the Eighties. She responded with grace and was humble about her influence which, in the power-pop genre, is substantial. And while the Icon disc features a new track with “Sun” and the Go-Go’s continue on as a unit (albeit with personnel changes…more later) she has found her comfort zone and sounds like a woman who has found contentment outside of the celebrity bubble. Popdose: What was involved with putting together your entry into the Universal Icon series? Belinda Carlisle: Well, it’s funny because it started off [that] my son found this song [“Sun,” the new track from Carlisle that is featured on the Icon collection] that was really good and I had no intention of really recording English pop again — my last album was all in French. But it was a really good song, so I thought “okay, let’s record it and see what happens.” I had no idea what we were going to do with it and then as it happens, Universal was thinking about putting out a best of in the Icon series and it just kind of went together really nicely and it gave me something new to put out. It gave me a chance to put out a collection of some of the great singles and here I am! [Laughs] I didn’t think I’d be here a year ago — it wasn’t something that I really planned, but it’s all worked together really nicely and it’s kind of fun. Oh absolutely. From your side of things, is this track an intro to a potential new album? I don’t know. I really don’t know. It’s a big commitment, so I’m not sure that I want to do that. But there’s so many different formats and so many different ways to put new material out these days, so I’m not going to say never, because it’s been something that’s come up quite a few times in the past couple of years. So possibly, I don’t know. Your solo career found you becoming much more pop, even adult-contemporary with “Circle in the Sand,” for example and you gained a lot of career ground with the solo stuff. As a matter of fact, I think that when the name Belinda Carlisle is said, most people will automatically hear “I Get Weak” or “Mad About You” over any of the Go-Go’s hits…yet it is a far reach from your “punk days.” When you went solo, what was your thinking at that time? Was it a natural progression for you or were there times when, as mentioned before, that you wanted to throw curve balls that “Belinda the Pop Star” couldn’t? Well, no, you know [that was never a problem], even up until Voila, which was a true reflection of where I was at, because I had been living in France for 20 years. The transition from Go-Go’s to pop, I mean, I grew up with California radio. I grew up with the soaring orchestrated pop songs. So it was in my blood. I’d sit in front of a speaker and listen to KHJ every single day from 1968 until 1976 when I graduated, that’s when music changed a bit and I found punk. Everything I’ve ever done has always been a really honest representation of where I was at. So for me, that was an easy transition. In my experience when I’ve been in the studio with any album, including the early Go-Go’s stuff, you know, you go in with an idea, but usually a project takes on an energy and a life of its own, as it did with that first solo album. So it was really truly me, as was the Go-Go’s and as was the punk side of things. My albums through the years have always been just an audio photo book of where I’m at with my life. That was an interesting period for you, because like a lot of other artists at that point of the ‘80s, you were recording songs that had been written by other people. But at the same time, it seems like Rick Nowels, who produced the Heaven on Earth album and some other stuff for you, was an important connection that you made that paid a lot of positive dividends. How did you connect with Rick? That was really an amazing partnership and that was actually through Stevie Nicks, who suggested that we work together. That’s how that happened. It was weird. He had just written “Rooms on Fire” for her and it’s funny, I’m not good friends with her, but we’ve crossed paths through the years and I’m a huge fan of hers and she’s the one who suggested it, so it happened. [Luckily,] Rick always understood me as a recording artist and understood what I was about. I didn’t have to tell him “no, I won’t sing that” or “I’ll sing this” or “I don’t like that melody.” It just worked and he got me. He just really got me and I was really lucky to have worked with him and people like Ellen Shipley and Diane Warren, who really kind of got the kind of recording artist that I am. It was an important collaboration, because you were able to take those songs and really make them your songs. Not everybody can do that. Yeah. Rick loves my voice and I know I don’t have the best voice in the world, definitely, and he knows that. But there’s a quality that he finds unusual and it works for him. He wrote songs and melodies that were tailored for my voice. Were you okay with things at that time? Did you ever want to have more of your own voice in there as a writer? I was okay with the way it was. You know, I don’t….and I’m sure my bandmates in the Go-Go’s would disagree, but I don’t really consider myself much of a writer and I think maybe that’s because I’m kind of lazy too. I know I have it in me if I really, really do it, because I co-wrote every song and co-produced every song on Real. I [also] wrote a lot of the Go-Go’s early lyrics and stuff, so I have it in me, but I was really quite satisfied because the songs were so perfect for me, to take a backseat and let somebody else do the writing. Looking at your solo songs, which ones hold up best in your own estimation? Which ones still make you happy when you sing them? “Mad About You” is one of those songs. “Summer Rain” is probably my favorite song I’ve recorded, one of my favorites. “Circle in the Sand”….there’s three or four I can think of. [When it comes to] the Go-Go’s, I’d say “Lust to Love” [and] there’s a few Go-Go’s songs — but usually the more obscure songs. I’ve seen that the Go-Go’s in recent years have worked “Mad About You” into the setlist. Are there any other songs that you’ve worked into the setlist or perhaps plan to? We did “Call Me Maybe” on the last go-around, which was really funny and it shocked people. Actually, Rolling Stone voted it as one of the best cover songs of last year! [Laughs] Go figure. I’ll tell you, it’s really hard to sing. It was not a fun song for me to sing. In the power-pop sub-genre, your work, at least portions of it, is seen as barrier-breaking stuff and as a positive influence for younger artists. How do you feel about now being someone who is looked up to, especially from your beginnings where you felt so looked-down-upon? I get messages and people coming up all of the time and you know, it feels really good now that I know that I can walk my talk and be a good influence, not [only] musically but in a lot of different ways. And you know, I have a strong back catalog and I’ve had a very tumultuous but amazing career and I have a lot of experience to draw from. It feels good to be able to give advice and like I said, walk my talk. I’ve been asked through the years for words of wisdom and I’ve been around, I can dig it up if I need to. Looking at that tumultuous side of things, what is the one thing that you tell people who are looking for advice as far as the big “don’t do this ever” kind of thing? I always say don’t do drugs. That’s my number one word of advice. The initial run of the band lasted for three albums. If the media landscape of today was in place then, with so much scrutiny placed on celebrities in almost a constant watch and TMZ and all of that stuff, could the band have lasted even that long? Oh no way. Back in like 1981 and 1982, I was like the Lindsay Lohan of that time, actually. Honestly. I just didn’t get photographed. I would never ever ever have been able to survive what I can imagine that she goes through. I see a lot of myself in her, actually. Eventually, it catches up with you and let’s just hope it ends well. It’s a different time now. And the Go-Go’s couldn’t have existed at this time now either, because it came from an organic place, not a manufactured place and there’s not a lot of nurturing of new artists these days, artists that actually are a bit out of the cookie cutter norm. So I am not so sure they could have existed. It seems like it is even harder for groups like the Go-Go’s to release new music, just because there’s so much involved democratically in doing so. Is a new album possible? It’s been a while. I don’t know. I think that there’s so many ways to put out new music now besides albums that yeah, I can see us doing something new. I can see myself doing something new as long as it wasn’t a huge commitment. But as with myself, the Go-Go’s just kind of wing it as we go along. That’s just how we work. Fans were very stoked about the expanded Beauty and the Beat reissue that came out in 2011. What are the possibilities of a similarly expanded reissue of the Talk Show album? Um, I don’t know. Maybe possibly. We haven’t even thought about that. But I think that whole thing, we’d have to get on it, because next year will be the 30th anniversary of Talk Show….that’s really scary, oh God. The Go-Go’s just announced that Kathy Valentine has exited the lineup. What’s the situation there? Well, I can’t really go into details, but I will say for a band and a longtime member to have parted ways, there has to be some really significant reasons. That’s all I’ll say. Bands just don’t do that just because they act on a whim, believe me. It’s sad, because she was a longtime member, but it’s…..you know, life goes on and the Go-Go’s will go on. The Belinda Carlisle Icon compilation will be in stores on March 19th. Visit Belinda’s official website at www.belindacarlisle.tv for more information. The Go-Go’s will be on the road this summer with the B-52’s. Check out the latest tour dates via the band’s site.